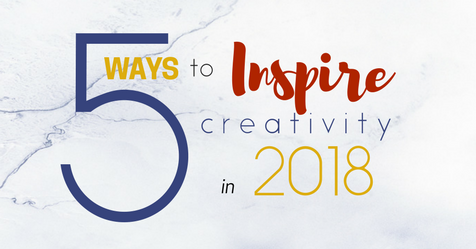 Whether you’re a self-proclaimed artist just hoping to create more in the new year, or an arts appreciator who wants to infuse their life with a little more color, here are 5 easy ways you can get inspired and energize your creative instincts in 2018. V isit a Gallery Exhibit or Museum – The colors, textures, history, and craft exhibited in a museum or gallery can be awe-inspiring. Spend an hour or two surrounding yourself with others’ creations and it’s sure to energize your creative mind. Check out our Arts Directory for ideas on where to start. E nliven Your Space – Your environment can influence your sense of comfort, productivity, and overall mood. Which is why when it comes to your home or work space, something as simple as a piece of unique art that speaks to you can have a big impact. A single piece or collection of art can also serve as the spring board to inspire the décor of an entire room or house. You can see exactly what we’re talking about at this year’s Art Tour of Homes, on Saturday, January 27th. Click here to learn more and get tickets. Listen to Music – The benefits of music to stimulate the mind are recognized from pre-school to med-school. Turn on your favorite album, pick up an instrument, or catch a show. You won’t be able to stop your creativity from flowing. Our Arts Calendar is full of upcoming performances and musical events. Get Outside – “Art is but an imitation of nature.” A stunning sunset, a placid lake, feeling a cool breeze on a warm Spring day, or wondering at a rare snowfall, the outdoors are a source of natural inspiration. Whether you to paint, draw, photograph, sculpt, play a song, or write a poem, let nature serve as inspiration to create. Become a Patron of the Arts – You don’t have to be an artist to help build a creative community that improves quality of life and economic growth! In 2018, why not resolve to donate your time, resources, or money to the arts? Click here to learn more about how far your dollar goes when you choose to donate to Arts Huntsville (and discover the perks of becoming a patron)!